One way to raise your profile as a writer is to diversify, especially if you are self-publishing your work or being published by a small independent press. As I’ve said in a previous post, the best way to sell more books is to write more books – but that doesn’t mean you should focus solely on writing those books. It’s also worth seeking other ways in which to get your name before readers. This is especially true for self-published and independently published writers, who do not have the presence or klout of a big name publishing house behind them. If that’s how networkophobes want to play it, that’s their loss, but personally, I practise what I preach. I juggle all kinds of writing-related activities, not only writing short fiction (my first love) and blogging (a close second), but also creating WordPress websites for authors, writing about book promotion (see my handbook for the self-published author, Sell Your Books!, and reviewing every indie author’s book that I read. Like most authors, I also have a day-job (part-time, in my case), working for a fabulous children’s reading charity, Readathon. Even better if you can engineer your day-job to feed into your writing. I’m lucky: in my world, all roads lead to books. When I encountered the versatile and multi-tasking Jessica Bell on the fab Facebook forum of the Alliance of Independent Authors, I felt as if I’d met a kindred spirit. I was also hugely envious of her location: Greece, where she alternates between her base in Athens and her writing retreat workshops on the Ionian island of Ithaca. As well as writing fiction and non-fiction, poetry and songs, she pens articles for literary magazines, is co-editor of Vine Leaves, and writes and edits for English Language Training companies all over the world. Jessica’s most recent publication is the latest in her Nutshell series of mini writing guides for authors. With all that going on in her life (when does she ever sleep?!) she is an object lesson in how diversifying writing-related activities enables an author to reach a wider readership than if she focused solely on her novels and poetry. I was delighted that she could find time to join me here to talk about her lifestyle. Q) Jessica, I thought Sell Your Books! was slim, but the books in your Nutshell series are positively snack size, resembling a partwork magazine. Personally, I find this a really practical format for authors who want to improve their craft but have no time or energy to read a big tome about it. (What author doesn’t comfort-buy bigger style guides that never get opened or acted upon? Just like recipe books and diet guides!) But why did you take this approach rather than combining all the tips into a single book? A) You know how in Anne Lamott’s Bird by Bird, she says that in order not to be overwhelmed, a writer needs to focus on short assignments? She refers to the one-inch picture frame on her desk and how that little picture frame reminds her to focus on bite-sized pieces of the whole story. Basically, if you focus on one small thing at a time, the story will eventually come together to create a whole. I believe the same applies to learning the craft of writing. If writers focus on one aspect of the craft at a time, the process will seem less daunting and piece by piece it will come together. Q) Will you combine them into a single volume once you’re done, or will this be an ongoing series ad infinitum? A) The plan is to release one book every six months, and I’m hoping to write at least six, so it will be a while yet before there is a single volume. But once they’re all written and released, yes, a box set is definitely an option I’ll be exploring. But that could be another two years away. We’ll see. Q) I was slightly surprised that you’d grouped adverbs and clichés together. Like all careful writers, I avoid clichés like the plague (ho ho) but hadn’t considered adverbs to be necessarily (oops!) undesirable. Are they really equal crimes of laziness? A) Before I answer this, writers need to understand that they aren’t always going to be a problem. You don’t need to go overboard trying to eliminate every single adverb in your manuscript. Because sometimes, they just work. Same with clichés. They serve a purpose. Especially in dialogue. Of course, it also depends a lot on your character’s voice. Because they come naturally, we frequently utilize them in everyday speech (see?). But in fiction, too many adverbs weaken prose. It’s considered “lazy writing,” because it means we don’t have to show what’s happening. If your manuscript has too many adverbs, it most likely means that the emotion you felt while writing it is not going to translate to the reader in the same way. Because the way in which one experiences things isn’t always the same as the next person. As writers, it’s your duty to make readers experience your story from a unique point of view. Your point of view. Adverbs stunt this. Q) I loved the hands-on format of the book, prescribing set exercises for the reader, each sample to be read and considered four times, in four different ways. Is this the sort of activity you include in your writing retreats? If so, did the books evolve from your experience of running the retreats? If not, where did you get the idea for this format? A) No, this idea didn’t come from the retreats. I make a living as an editor/writer of English Language Teaching materials for various publishers worldwide, so I guess “breaking down” the language is a technique I’m used to incorporating in ELT lessons. It’s effective there, so I thought, surely it’s going to be effective with fiction too. Q) Can you tell me the themes of the next books you have planned in this series? A) I haven’t finalized all my topics yet, because I need to start writing to see which ones lend themselves well to this format. But my list of possible topics include: superfluous words, crafting natural dialogue, subtext and conflict, weaving in relevant back-story, chapter endings, characterization, avoiding stereotypes, making setting count, using the six senses. Q) Are you promoting each book in the series in the same way or, if not, what have you learned from the earlier launch that has made you launch this one in a different way? A) Yes, I think I’ll stick to my current marketing plan. Seems to be working well. The only different thing I’m doing this time around is encouraging virtual tour participants to interview me in real time on Facebook and Twitter. I think it’s fun to follow a conversation as it gives people an opportunity to actually engage and interact, rather than just leave a comment on a blog and not really know if I’ll respond. Though I do try my best to respond to everyone! Q) Turning now to questions about your career, I’m impressed by the diversity of your writing activities and by your energy. Just reading the list of the links in the footer of your email is exhausting! Did you set out to formulate this “portfolio career” approach, or has it just evolved? In what order did they accumulate? A) Haha, no I did not set out for the long list. I just had some ideas and wanted to bring them into fruition. My mother always said, if there’s a will there’s a way. (Hey, look, cliché!) If I want something enough, I do it. Full stop. There’s no such thing as failure in my vocabulary. There’s try. And try again. I can’t really remember in what order they happened. I think all my ideas started to come together at once! Q) How do these activities feed off each other or cross-fertilise? A) Well, they’re all writing related, so I do try to link them together on occasion. One recent example is the vignette contest my literary journal ran for the chance to win a scholarship to the writing retreat I run. Nice smooth connection there. And both organizations benefit. A) There is a lot about Greece in my debut novel, String Bridge, but I have to say that Greece had already started to influence me when I was a kid. I must have been about eleven. I remember sitting on a rock by the sea in a little place called Monemvasia. I was so inspired by my surroundings that I needed a way to express it. This is when I started writing poetry. In the end (well, beginning), Greece is what sparked my passion for words. Also, I would never have got my first job as an editor if I hadn’t moved here. As I said above, I make a living as an editor/writer of English Language Teaching materials. There is no need for this sort of thing in an English speaking country. So I guess, I have Greece to thank for giving me the opportunity to pursue this career path. If I had have remained in Australia, I probably would have focused more on my music. A) I believe that all these writing-related activities mean that I need to be online quite a lot. As a result, I’ve become visible, to quite some extent, through social media. And to be honest, I couldn’t live without it. I’m quite isolated being an English writer in a non-English speaking country, and I need to promote my work to the English-speaking world. The key to social networking, though, is to engage in conversations, interact with your audience. Saying, “buy my book, it’s great” all the time, isn’t going to sell it. But saying “hey, what do you think about blah blah blah?” and actually eliciting opinions from others, means you are saying something that people are interested in. And if they’re interested in what you’re saying online, then it’s likely they are going to investigate you further. It’s a long process, and hard work. But it certainly pays off. How’s this for statistics? I’ve been blogging and engaging in social media, pretty much every single day, since March 2010. And only this year, three years later, have I started to see true results. It takes effort, persistence, stamina, but most of all love and passion. Because this ‘being visible’, (and let’s sign off with a good old cliché, hey?) doesn’t happen overnight! Thanks again, Jessica, for sharing so many inspirational tips and lessons, and best of luck not only with your latest Nutshell book but with all your many literary undertakings! 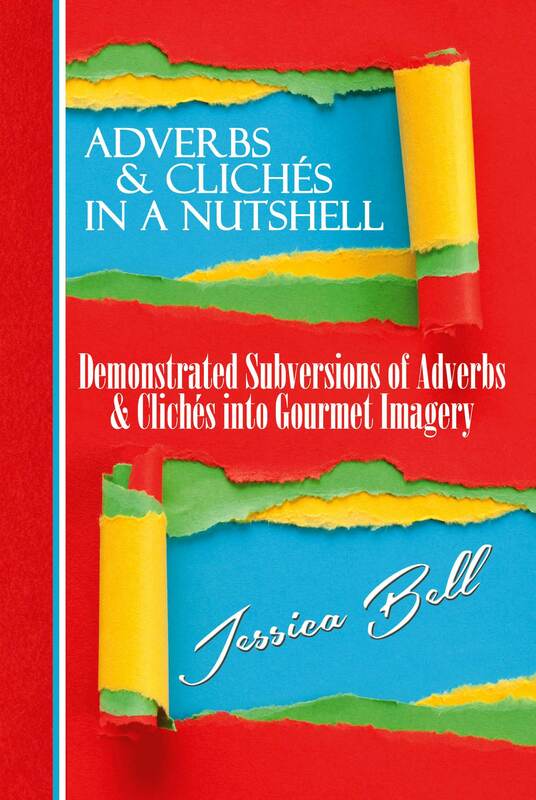 To read my review of Adverbs and Clichés in a Nutshell, please click here. To network with other writers via the Alliance of Independent Authors, click the yellow and gold rosette in the sidebar on the right of this page.